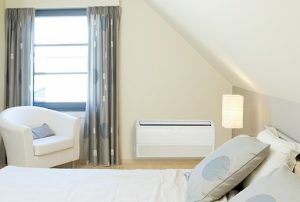 Ductless split systems are also called Mini-Split Systems. Ductless split systems are the ideal air conditioning and heating solution for installations where adding duct work is impractical or too expensive. The matched combination of an indoor air handler and outdoor condenser is extremely efficient and reliable. The indoor units can be mounted on almost any wall. You can even install multiple zone indoor units with just one compact, outdoor unit! 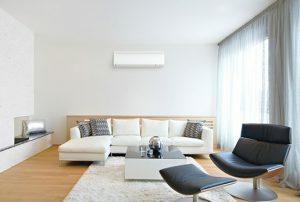 Ductless air conditioners and heat pumps offer a higher efficiency than traditional systems. And they do this with less noise, and no costly duct work! The units are operated by LCD wireless remote controls and are packed with convenience and comfort features. Technician installing tubes for a ductless split system in an apartment. 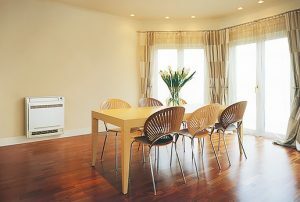 Ductless Split Systems are available as Split Systems and Multi-Split Systems. Installs simply and unobtrusively to buildings with no need for duct work. 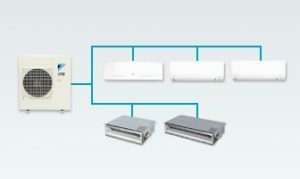 Connects up to five indoor units to a single outdoor unit. Installs a complete air conditioning system to multiple zone interior spaces with no need for duct work. Perfect for old homes with no existing duct work. Great for garages, bonus rooms, sun-rooms, and additions. Whisper quiet… With sounds levels ranging from 19-35db, you’ll barely know it’s running. Room-by-room temperature control… You won’t waste energy by cooling an unoccupied room. Variable speed inverter -driven compressors adjust capacity to match demand. When the system is running at low speed, humidity and comfort are optimized, and efficiency can reach nearly 40 SEER! 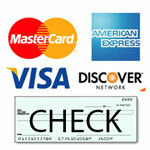 Fast Installation… Installs quickly and easily, having no need for major construction and remodeling. Easy Maintenance… With easily accessible, washable filters and no duct work to keep clean. Environmentally Friendly Refrigerant… Uses R410A, an environmentally friendly refrigerant. Daikin’s split and multi-split type air conditioning systems offer superior performance, energy-efficiency, and comfort, in stylish solutions conforming to all interior spaces and lifestyles. An extensive product lineup utilizes Daikin technology for lower costs and environmental impact. 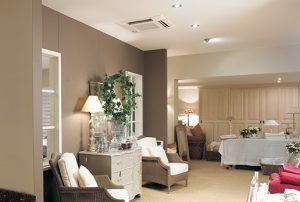 Individual Control – Each indoor unit can be operated independently to deliver air comfort only to rooms where needed. Energy and Cost Savings – Advanced inverter and heat pump technologies achieve greater efficiency and energy-savings at lower costs. 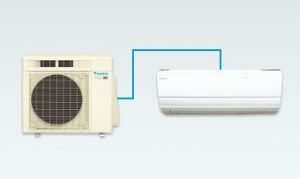 Flexible Installation – Daikin compact split/multi-split air conditioners easily install to residences where space is limited. Extensive Product Lineup – A broad array of models allows the perfect match of style and performance to any interior space. 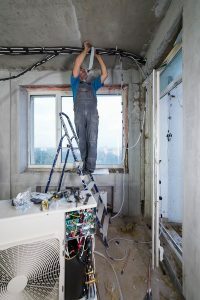 Compact size and ease of installation make split and multi-split air conditioners the popular choice for new construction and renovation projects. Utilizing our own unique cutting-edge technology, Daikin further raises the bar with high-capacity air conditioners offering unrivaled performance and energy-savings. Employing the new refrigerant R32, Ururu Sarara provides efficient airflow in a stylish shape that also humidifies and dehumidifies without need of a water tank. The simple and elegant flat panel design complements any interior decor. Its refined appearance and functions provide homes with a comfortable living environment. 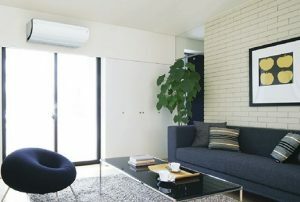 This space-saving air conditioner of simple and neat appearance distributes air comfort throughout the room. The floor or ceiling suspended slim, rounded design allows both ceiling-suspended and floor-standing installation. Ceiling-suspended installation frees up wall and floor space, while floor-standing installation provides added flexibility conforming to customer needs and preferences. The ideal air conditioner for installation inside narrow false ceilings—with only the decoration panel visible after installation. Slim Body – As little as 6 inches thick and inspired by a beautiful U design. This design presents space flexibility and great artistry. Super Quiet Design – The noise level can be as low as 21dB(A) which is 3-6 dB(A) lower than a conventional air conditioner. Fresh air supply ventilation provides maximum comfort with up to 7 fan speeds. A&K’s expert technicians can install ductless split or multi-split systems in your home. Contact us for more information.